In a remote corner of Victoria’s south-east, the pristine waters of Bass Strait lap the mother of all Australian beaches, the Ninety Mile Beach – the third longest uninterrupted beach in the world, after Praia do Cassino in Brazil and Cox’s Bazar in Bangladesh. 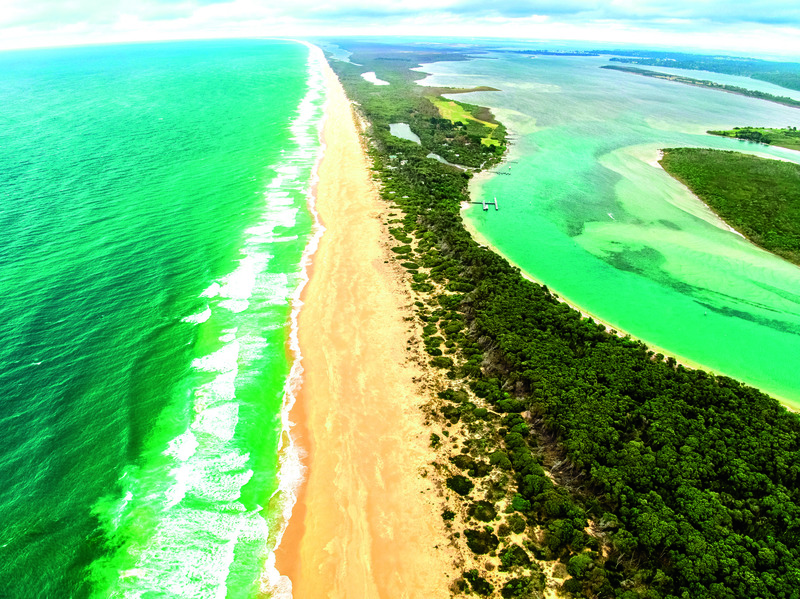 An unbroken, gently curving beach extending from Reeves Beach near Port Albert in the state’s south-east to Lakes Entrance in the north, the Ninety Mile Beach is backed by dunes for its entire 125 kilometre length. With golden sands stretching as far as the eye can see, the beach separates the Bass Strait from the Gippsland Lakes – a network of lakes and lagoons covering more than 600 square kilometres, making it the largest inland water system in the Southern Hemisphere. Main access from Melbourne is via the Princess Highway, on a 244 kilometre drive through Traralgon to Golden Beach, which is roughly halfway along the Ninety Mile Beach. However, to fully appreciate the region and its hidden nooks, it’s worth starting at the southern end near Port Albert. 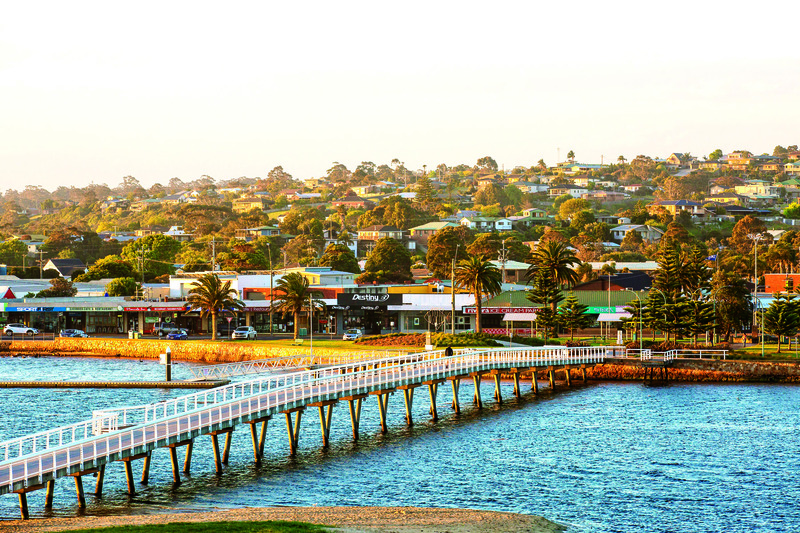 Port Albert sits 234 kilometres south-east of Melbourne via the South Gippsland Highway. It’s one of Victoria’s earliest sea ports, dating back to 1841. To this day, it remains a commercial fishing port, with catches including flathead, snapper, King George whiting, salmon and perch. This seaside settlement has several historic buildings, which you can see on a stroll around town. Take time to wander through the Maritime Museum, housed in an old bank and featuring a wide collection of artefacts, from cannons and sealers’ harpoons to giant anchors. Recently updated RV facilities make Port Albert a convenient overnight stopover for camper trailers. These facilities, located close to the township and boat ramp, are free to use. There are several small fishing communities off the highway on the 34 kilometre drive to Woodside Beach. These include Manns Beach and McLoughlins Beach, where you can wander along a boardwalk across the mangroves on the one kilometre return walk to the Ninety Mile Beach. Just north of here sits the hidden beachside gem of Reeves Beach. At Reeves Beach Camping Ground, you can set up your camper trailer and stay for free. It’s simple – there’s no power, and it’s BYO drinking water and firewood, but there are basic toilets, tables and seats. The track into the campground is quite potholed. Once through it, holidaymakers manoeuvre camper trailers beneath the shade of Manna gums and banksia. From camp you can stroll through a bush-covered dune to the long sweep of beach. From Reeves Beach it’s 14 kilometres north to the hamlet of Woodside and, from here, 11 kilometres to the coast and Woodside Beach. While visiting this equally glorious stretch of shimmering sands, you can stay at the Woodside Beach Caravan Park, surrounded by farming country and with easy access to the beach (which is patrolled by surf life-saving during peak holiday periods). From Woodside it’s 47 kilometres north to Seaspray, a small coastal town where holidaymakers go to fish, boat, surf, swim and bushwalk. During our latest trip, as we left Woodside and headed through the farming country full of grazing cattle, we took a backroad towards Seaspray and noticed a sign pointing to McGaurans Beach. After tracking 11 kilometres along a gravel road, we came upon the isolated free camping (without facilities) literally metres from the beach. Some people even decide to camp on the beach, so they don’t have to walk too far to cast their surf rods into the glassy blue waters. While there are some car tracks on the seashore – you can launch boats here – for the most part the long arc of gilded sands, seemingly endless in both directions, is untrammelled by human footsteps. Dogs are permitted, but must be on a lead at all times. On our way out we experienced an Aussie outback traffic jam – that is, a herd of cattle trundling along in front of us – before proceeding along the narrow roads and single-lane bridges to Seaspray. Seaspray is a quiet beachside community with historic cottages, plenty of holiday houses, a general store, large kids’ playground, a surf life-saving club, and its main attraction – that seemingly endless stretch of blue ocean beating onto white sands just beyond the sand dune that separates the beach from the town. Fishing is popular, with anglers enjoying both surf and creek fishing all year round, reeling in the likes of snapper, flathead, bream, whiting and shark. Shoreline Drive follows the coastline from Seaspray on the 27 kilometre journey north-east to Golden Beach, past a small community of holiday houses called The Honeysuckles. Free camping is available along this section at 19 campgrounds consisting of many campsites, including 50 that are suitable for camper trailers. The 19 campgrounds, conveniently numbered, are situated amid gnarled tee-tree and banksia right near the beach. There are no facilities (save for non-flush toilets at campgrounds three, five, eight and nine), so it’s BYO absolutely everything. Some sites are dog-friendly. Remember to pack insect repellent for any stay along this coast. The mosquitoes have been described as ‘savage’. Curiously, along this scarcely developed stretch, on the left-hand side of the road you see street signs with exotic names such as Flamingo Drive and Waikiki Way. The ‘streets’ – more like boggy, unpaved tracks – head into dense thickets of tee-tree with nary a house in sight. The saga of these desolate beach blocks is referred to as the longest running planning dispute in Victoria. From the mid 1950s until the late 1960s, a real estate agency sold almost 12,000 subdivided blocks along this 25 kilometre stretch, on behalf of a building development company. Touted as Victoria’s answer to Surfers Paradise, the inappropriately subdivided coastal dune and flood-prone blocks were sold largely to unsuspecting migrants, many of whom did not speak English. Soon afterwards, purchasers were told their land could not be built on, and the planning nightmare – now half a century-old – began. Promised infrastructure (such as paved roads, shops and a golf club) never appeared. Yet for decades thousands paid rates for land they were forbidden to build on. The scam remains unresolved. The subdivision’s exotic-sounding non-streets lead to marshy Lake Reeve, which is a significant feature of the Gippsland Lakes system. The quiet community of Golden Beach has a store, fish and chip shop, community centre, and golf and bowling clubs. It’s cheering to know that you can enjoy a hot shower at Golden Beach, for just two two dollar coins, should your camper not be equipped with a shower or should you want to preserve your water. A few kilometres north is Paradise Beach, made up mostly of holiday houses and a beachside campground managed by Parks Victoria. There are 12 unpowered campsites tucked amid tee-tree and banksia, suitable for your camper trailer. From here it’s around 30 kilometres to Loch Sport, situated on a narrow peninsula between Lake Victoria and the Ninety Mile Beach, with easy access to coastal parks. 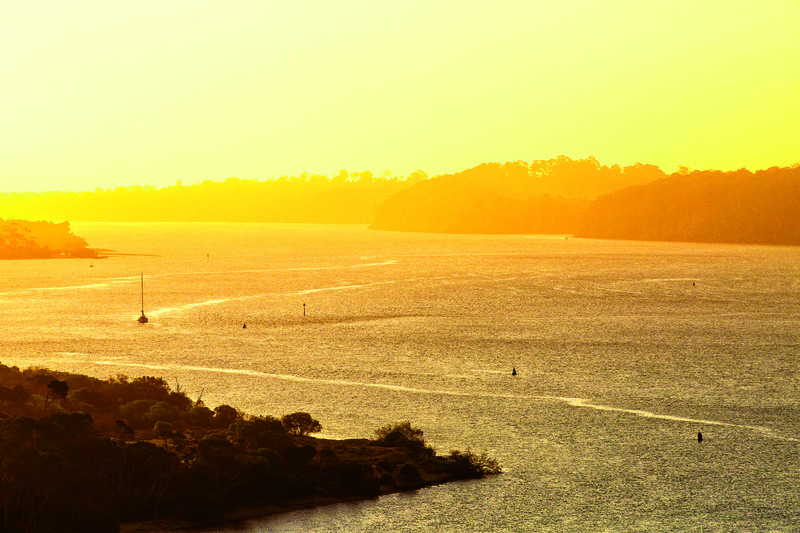 The 800 who live in this picturesque location, and the many who visit, have the best of both worlds. On one side, the tranquil lake caters to boating, kayaking, swimming and fishing. On the other, there’s the pounding waves and salt-whipped air of the Ninety Mile Beach. Loch Sport has a pub and bistro with great lake views, a small marina, supermarket, RSL, bakery, flash new lakeside barbecue pavilion, an excellent adventure playground, and a caravan park. Two national parks surround Loch Sport. 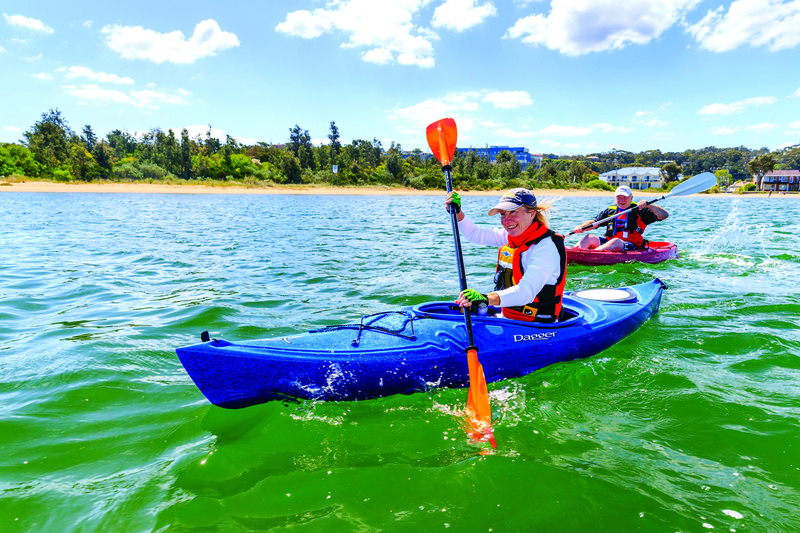 The first is the Gippsland Lakes Coastal Park, a 17,600 hectare reserve from Seaspray to Lakes Entrance consisting of lakes, wetlands, marine and terrestrial environments. The other is the Lakes National Park, a peaceful bushland retreat fringed by Lake Victoria and Lake Reeve, and including Sperm Whale Head Peninsula and Rotamah Island, which can only be reached by boat. 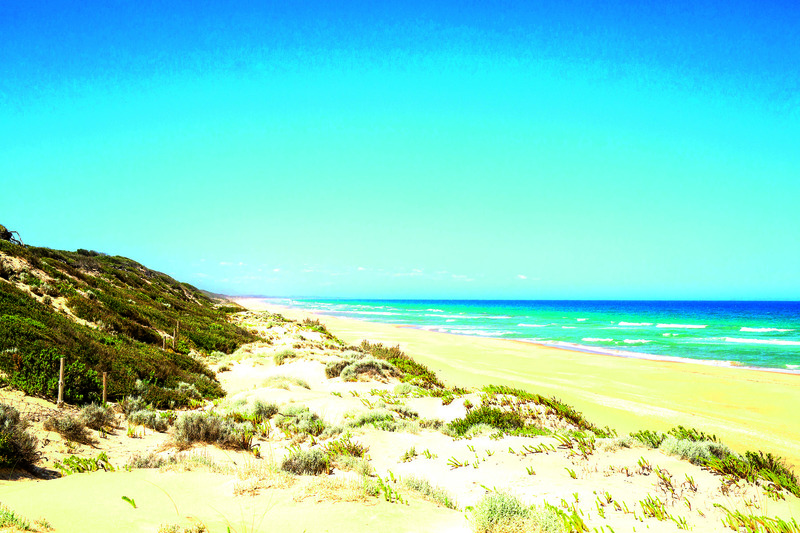 To experience the northernmost extremity of the Ninety Mile Beach, head inland to Sale (40 kilometres north-west of Golden Beach) and then on to Lakes Entrance (106 kilometres north-east). Sale is a busy regional centre with a variety of shopping opportunities. You can dine in town or picnic in the leafy 150 year old Sale Botanic Gardens. Onward from Sale, there’s several pleasant seaside towns to visit. One definitely worth visiting is Paynesville, a quiet resort town perched on the shores of majestic Lake King. It’s popular for boating and fishing, boasts some good eateries, and has four caravan parks. From Paynesville, a ferry transports people and cars, free of charge, on the 200 metre journey to Raymond Island, home to around 250 koalas. On the ferry ride over, you may be fortunate enough to spot Burrunan dolphins, which frequent McMillan Strait. Another such town to visit is Metung, which is 10 kilometres off the highway. With good eateries, inspiring galleries and boat hire, Metung acts as a dependable base camp from which to explore Gippsland’s waterways. 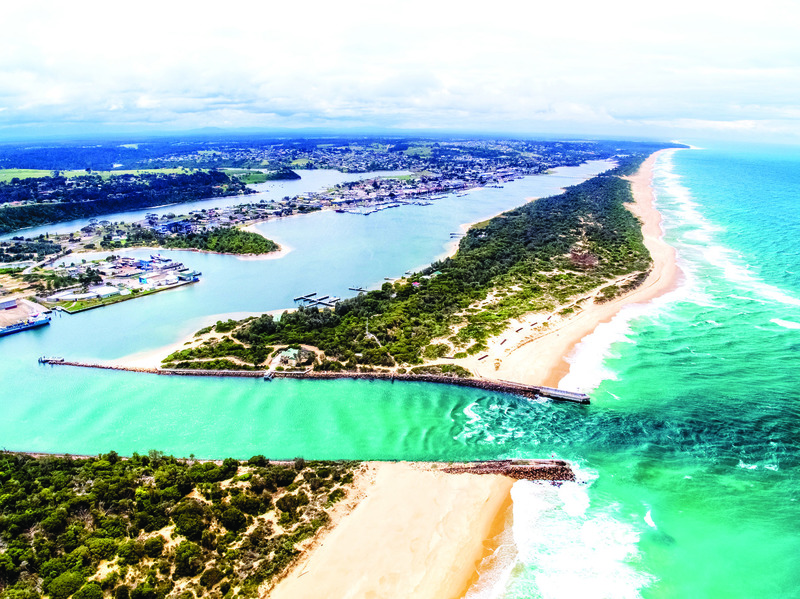 Lakes Entrance itself sits 318 kilometres east of Melbourne on the edge of the Ninety Mile Beach, where the Gippsland Lakes meet the Southern Ocean. It’s a popular place for all types of water activities, but is especially renowned for lake and ocean fishing. Add to this swimming beaches, waterfront cafes, a fleet of fishing boats, very good fish and chips, and a swathe of caravan parks.